At 's-Heerenloo, because of their new Information Strategy, the CIO needed a way of communicating ideas and the impact of new information & IT solutions, part of the strategy. The CIO and the management team wanted to create more support for the strategy and wanted to calculate the impact of a change of to support decision taking more. Dragon1 enabled this by letting the client visualize different views of the strategy: static views to show to various stakeholders and interactive / playable views to test and study the impact of change. At 's Heerenloo the impact of most important information principles was visualized. The most important information principles, needed to implement in order to execute the information management strategy, were selected. The information principles were visualized and also their impact was visualized with principles drawing in a design book. In this way the management could adjust the impact of the strategy and with the same visualization communicate the impact to create more support. At 's Heerenloo Dragon1 was used to visualize an EA Blueprint. After a few workshops, data was collected in excel sheets and these were imported into Dragon1 EA Tool - Enterprise Architect. And then together with view templates in the tool, a layered EA blueprint was created. With the blueprint everyone in the organization has an overview of the structure. With this, it is much easier to freeze, focus and discuss issues. And everyone has insights into his or her role in the organizations. A lot of benefits with only one visualization. In the information strategy the rollout of new information services is dictated. The business who ordered for these services was very curious to know when the new information services would appear and what their dependencies were. 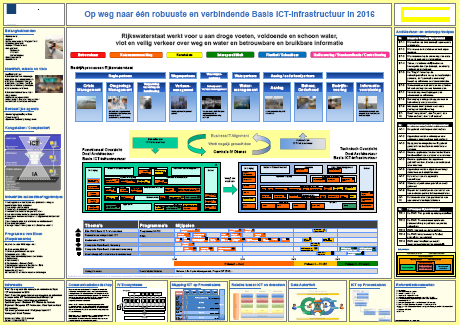 Immediately this roadmap poster had his impact on the planning of information services. To the right, you see a generic example of a roadmap. The actual roadmap may not be shown here because of information security matters.